« Apologies for the absence…. I’ve done a few posts about the way that cruise passenger numbers seem to be overwhelming some locations, and how in some cases those locations are responding by reducing access. Here’s another example – Dubrovnik. There is concern over the congestion that can occur in the Old Town and on the walls when several ships are in port. One concern is that the ‘Dubrovnik experience’ that day, for all visitors not just cruise passengers, cannot be good. Another concern is that with such a large number of visitors, both the physical environment and the tourist infrastructure (toilets, food and water provision, etc) are in danger of being overwhelmed. In 2015 a UNESCO investigation visited the city (it’s a UNESCO World Heritage site) and their report was published in March 2016. Here’s a link to a page from which the report can be downloaded. I was a little puzzled by a comment earlier in the Report which said (with respect to cruise passengers) “Although these visitors represent only a small proportion of total visitors (2.5% in 2013), they have a disproportionate impact on the World Heritage property due to their concentration in time and space“. This puzzled me at first, but I think the answer is that while there may be many more holiday makers staying in and around Dubrovnik during the season, only a very small number of them are aiming to walk the walls or visit the Old Town on any specific day or time. In the case of cruise passengers, however, pretty much everyone who’s able is heading for precisely these locations. The daily limit of 8,000 cruise passengers is already in place, but I gather it’s currently a ‘soft limit’ – it has apparently been voluntarily agreed with the cruise lines. (Calls at Dubrovnik may have been booked years in advance, of course.) 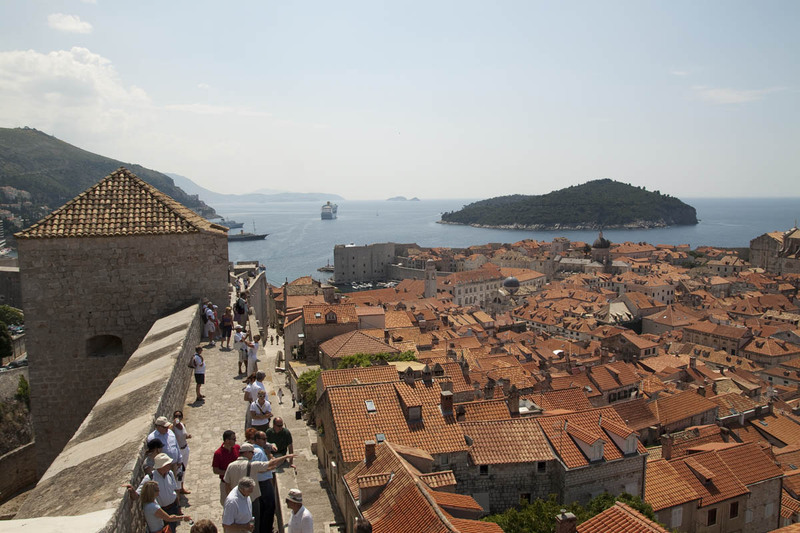 However, there’s now a story that a new mayor of Dubrovnik is aiming to reduce that still further, to 4000 passengers a day. Here’s a link to a newspaper article about it. This is another straw in the wind. It must be clear to anyone who’s visited any of these places in recent years that the numbers of visitors has become overwhelming, or nearly so. Cruise visitors seem to be especially criticised, but there may be some justification – we are only in a port for a few hours, and en masse we head straight for honeypot locations in ways that perhaps those visitors there for longer stays, don’t. And numbers of cruise passengers have certainly been increasing, even in the fairly short time (12 years) we’ve been cruising – I have a feeling that if we looked at total passenger load in some of these ports in the mid-2000s and compared them with, say, 2015, we might be shocked at the increase. This issue isn’t going away. The ships are getting bigger and the passenger numbers are getting higher. Ten years ago P&O had a fleet of, I think, five ships – Oriana, Aurora, Oceana, Arcadia, and Artemis. Total capacity, maybe 9000. Today the fleet is Oriana, Aurora, Oceana, Arcadia, Ventura, Azura, Britannia and Adonia – total capacity, somewhere around 17000. And another even bigger ship to come. Other fleets have increased much more dramatically than that – MSC, for example – ten years ago they operated four vessels each with a capacity under 2000 passengers. Then there’s the two German lines, AIDA and TUI. Ten years ago TUI Cruises didn’t exist and AIDA had, I think, a couple of small ships. Now between them they’ve got about a dozen, including some significantly sized ships; capacity may be around 20,000 passengers or more. A quart just won’t go into a pint pot….. Here are links to a couple of previous posts I did on this topic: one on Venice, and another about Santorini. As you can see, my view on this does keep changing.